This article, written by Geoff Slack, originally appeared in the Winter 1990 copy of The Gazette, an In-house publication at Lucas Aerospace, York Rd., of which I was the editor. Geoff went on to make several major contributions and did a splendid article on The Birmingham Ballet, which we may reproduce here at some time in the future. Just picture this. Dinner, the blazing log fire, a comfortable armchair and a wee dram from the bottle that has been laying quietly in its Christmas wrapping paper in the top of the wardrobe, provoking much guessing as to what was in it. Macallan, Tamnavulin, Glenkinchie, Strathisla, Dalwhinnie, Glendeveron, all names to conjure up thoughts of misty Scottish glens with illicit stills hidden in heather shrouded caves producing the firewater from which today's sophisticated malt whiskies are descended. During the late 1700's and early 1800's distilling whisky had become a battle of wits, and sometimes more violent weapons, between the distillers and the excise men who, since 1707, had powers to destroy illicit stills and collect tax from those who chose to declare them. An assortment of laws of increasing ineptitude were introduced by the government in London to try to control these illicit operations. These laws had little effect, and it was only in 1823 when the Duke of Gordon argued that as they were not going to stop the highlander distilling his whisky, they may as well let him do the job properly and give him favourable conditions for making and marketing his product, that some semblance of order was achieved. The Duke and his fellow landowners agreed to do their best to encourage their tenants to take out licences for their stills. In 1823 the act was passed and a licence fee of £10-0s-0d per still and a duty 2/3d per gallon of spirit were set. It took almost 50 years for the number of illicit stills, detected by the excise men, to fall from 14,000 in 1823 to 6 in 1874. There are still illicit operations, but they are few and far between. Most of today's distilleries stand close to where the best of the illegal stills once operated, so now, as then, the quality of the water is of paramount importance in distilling a "Good Malt". 1) The barley is soaked in water from the chosen spring, spread out on the floors of the malting shed and allowed to germinate. This causes some of the starch in the grain to be turned to sugar. 2) The germinating barley is now dried over peat fires (a little heather or seaweed may also be added) and the smoke allowed to percolate through the drying grain. This process is known as malting and if one chews some of the malted grains there is a marked ‘Horlicks’ flavour. 3) The malted barley is now ground up and mixed with hot water in huge vats, typically 60,000 litres, and allowed to stand for some hours to dissolve the sugar into the water. This mixture is now called 'wort'. 4) The wort is cooled and, with added yeast, is allowed to ferment to produce a beer like liquid with about the same alcoholic content as beer. This liquid is called the 'wash'. 5) The next stage is the distillation. The wash is pumped into huge copper stills which are steam heated until the alcohol starts to vapourise. This is at a lower temperature than that needed to boil water which remains in the still. The vapour rises up the still and through the pipe at the top, known as the swan's neck and into the water cooled condenser. The condensed liquid is impure malt whisky and is called 'low wines'. The low wines are now distilled a second time, usually in another still, great care now being taken to collect the portion of the distillate having the least impurities. This is known as the middle of the run and is determined by the skill and experience of the distiller. The early and late parts of the run are returned to the low wines of the next run. We now have a clear, bright and colourless liquid which is pure mall whisky spirit and contains about 65% alcohol. 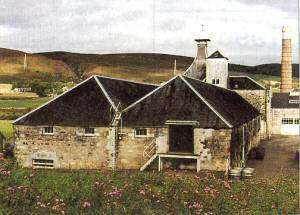 Many distilleries are quite old, (this photo shows the old distillery at Clynelish) having been built around 1825 onwards, when it became legal to distil whisky if you had the relevant licence. 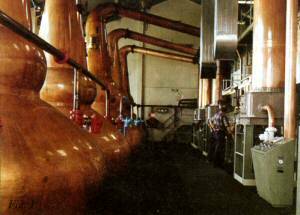 In most of these distilleries the original copper stills are still (sorry!) being used as it is widely considered that a new still, even if made to the same shape might impart a different flavour to the whisky, thus one will find stills in the older distilleries that look like an apprentice first-aiders night out, with "patches" everywhere. The first photograph shows the still room at Clynelish where the stills are new, as the distillery has recently been enlarged, and consequently they are as yet "unpatched". 6) Maturing the whisky to a drinkable state is the final part of the process and while it may take only a week to produce the raw spirit, the maturing process may take from three to twenty or even thirty years to complete. Most of the better quality malt whiskies are now bottled after ten to fifteen years. The whisky from the still is first piped to a spirit store vat from which the oak barrels in which it will be aged are filled. The barrels have generally been used before for maturing sherry and thus the oak has absorbed colouring and. to some degree, flavour from the sherry. Pure malt whisky starts fife as a completely colourless liquid and gains all its golden colour from the cask. Blended whiskies often have their colour enhanced with a little caramel - and that's quite enough about blended whiskies for the moment. Only when the taster decrees that the whisky has reached a suitable maturity is it bottled as there is no further maturation once it has been bottled. It is now ready for you to enjoy. There are about 140 functioning malt whisky distilleries in Scotland, the greatest concentration being along the valley of the River Spey and its tributaries. The whisky areas of Scotland are usually listed as Lowland, Speyside, Highland, Campbeltown, Islay and the outer islands. Generally each of these areas has its own distinctive characteristics, but within each area no two whiskies are identical, though in some cases the differences are quite subtle. The order in which the areas have been listed also relates to an increasing intensity of flavour ranging from (the relatively bland Lowland malts such as Bladnoch (most southerly) and Auchentoshan, which may be described as having a light delicate flavour, to the powerfully pungent Islay malts from Laphroaig and Lagavulin about which the press had the following to say. Laphroaig - "Don't follow this with anything but bed" and Lagavulin - "A thunderer, smells and tastes of TCP... evoking cries of long dead hedgehogs, absolutely delicious". Between these extremes lie malt whiskies with an incredible range of flavours, certainly enough for a lifetime of searching and savouring. Returning to the area classification, the next area up the flavour ladder from the Lowland is Speyside. A drive along the upper reaches of the river Spey and its tributary, the Livet, will reveal a distillery "around almost every bend". Perhaps the best known are those that come from the 'Glenlivet', "The Glenlivet" from J&G Smith, Macallan, Longmorn and Aberlour Glenlivet being excellent examples of the mellow, smooth, lightly pealed whiskies of that area. Speyside brings us, amongst many others, Glenfiddich, perhaps the best known of all malt whiskies, and its sister malt Balvenie. These two distilleries are only a stone's throw apart but produce very different flavours from the same water source and the same ingredients; different still shapes perhaps! Moving on, the Highland Region, which loosely covers mainland Scotland north of the Firth of Forth, but excludes Speyside. Some of the more notable and more distinctively flavoured malls are Glenmorangie and Balblair from Tain, on the Dornoch Firth; Clynelish from Brora; Oban from Oban; Old Pulteney from Wick; Edradour ( Scotland's smallest distillery) and Glenturret from the Pitlochry region. Next stop on the tour is Campbeltown, once the whisky capital of Scotland, but now with only two distilleries left in production, Longrow and Springbank are however worthy reminders of the past glories. Oddbins' wines merchants description of a 25 year old Springbank says it all, "Stunning intensity of flavour with amazing delicacy. The nose is pure, rich and malty with an overtone of orange blossom". Islay and the outer islands (Jura, Mull, Skye and the Orkneys) are the final calling points. Looking at the islands first, Highland Park from Orkney is a full flavoured malt, smokey and peaty, though less heavily flavoured than the Islay malts. Talisker from the Isle of Skye has a taste all of its own, a salty tang coming through the strong peatiness. Mull (Tobermory) and Jura produce interesting malts but when compared with Taiisker and Highland Park lack a little character. Islay malts are, in my opinion, the ultimate flavour experiences. From a relatively small island come, in alphabetical order, Ardbeg. Bowmore, Bruichladdich, Bunnahabhain, Caol Ila, Lagavulin, Laphroaig and Port Ellen. Pungently peaty with overtones of iodine is the easy way to describe Islay malts but they really have to be tasted to appreciate the wide range of additional flavours that are encompassed by that statement. Many of these malt whiskies are available in "miniature" bottles and unless one owns one's personal oil well, this is the best way to sample the flavours of the different regions. A number of distilleries do not bottle their own product as they primarily supply the Blended Whisky trade. However two independent merchants, Gordon & McPhail and Wm. Cadenhead purchase casks and mature them to their own judgement, then bottling them under their own name but also naming the distillery. The Gordon & McPhail bottlings are labelled Connoisseur's Choice and are generally available in both full bottle and miniature sizes. For those with the courage to venture where the Romans feared to tread there is the ‘Whisky Trail’, a well signposted tour of a number of the Speyside distilleries who welcome visitors with a guided tour (the smells from the various stages of manufacture are a delight in themselves) a visitor centre, souvenir shop and of course a tasting. Most are free, though some with more comprehensive facilities now charge - still worth it though. In addition to the Whisky Trail many other distilleries welcome visitors though some of the smaller ones prefer a telephone call before you arrive as they work with very little staff, often as few as five or six men. The local tourist office can usually advise and is generally pleased to make the relevant telephone call for you. Before getting to the reading matter, a personal choice of "12 to try", most of which are available as miniatures. Without going to the extremes of the reverential rituals proposed by some experts or "doing a Hadrian" there are ways to increase the enjoyment of your malt and, bearing in mind what it has cost, you may as well get the maximum enjoyment possible. It is quite simple really, make sure that the budgie is in its cage, arm yourself with a small tumbler of even a tulip shaped wine glass, some decent STILL water (Buxton or Malvern are as good as any) and your chosen malt. Pour yourself a measure (or two) and smell it, the aromas are quite distinctive and many whiskies can be recognised by smell alone, add some water, equal measures to the whisky give you a good chance to savour the flavour, sit down and enjoy yourself. The variety of available malt whiskies is growing steadily as more people begin to appreciate them. Nowadays most off-licences stock a reasonable range with the more specialist merchants, such as Oddbins, stocking a very wide range. Some supermarkets, Tesco for example, stock steadily widening ranges. If you are having a day in London a visit to Wallace Milroy's shop in Greek St. (just off the north side of Shaftesbury Avenue at the Cambridge Circus end) has probably the widest range of malt whiskies "south of the border" in both miniature and full bottle form - a veritable Aladdin's cave.